It’s the rainy season for Brazil. But, thus far, adequate rains have not come. 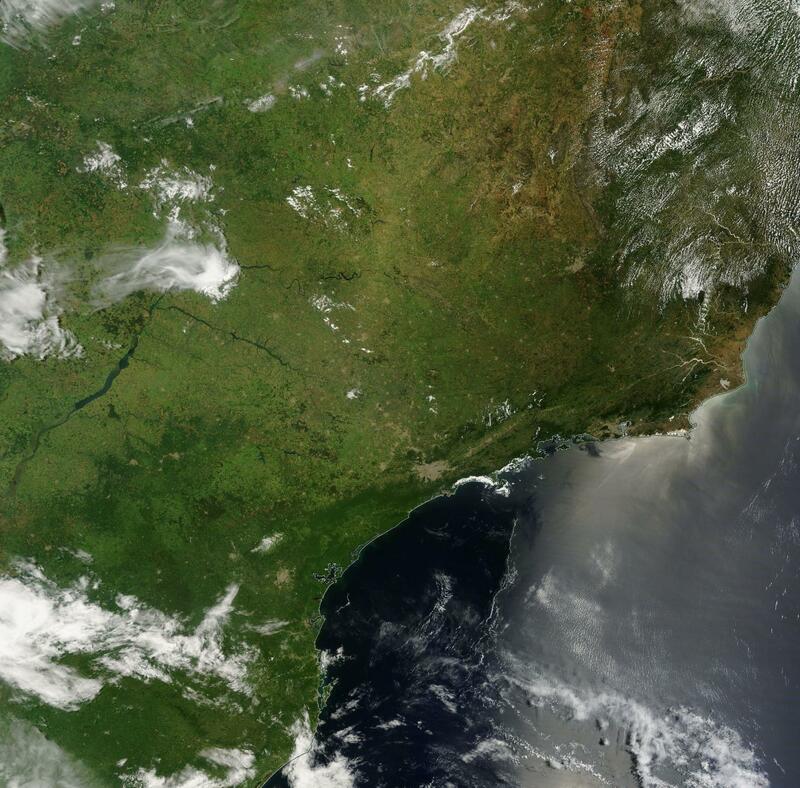 A persistent high pressure system has lingered over Brazil. A blocking high of the kind that has now become so common with global temperatures spiking to more than +0.8 C above 1880s averages — thickening heat domes and granting these powerful weather systems an ever greater inertia. A set of circumstances that has set off a plethora of very severe droughts ranging the globe since the early 2000s. During early 2015, Brazil’s own persistent atmospheric block re-strengthened over an Amazon whose water re-circulating abilities have been crippled by a combined deforestation and ever more prevalent wildfires. Ever since late December, the high has warded off cold front after cold front. The result is a terrible extension of the worst drought to impact Brazil in at least 80 years. During December, this dogged weather system kept rainfall totals below average — at about 80 percent typical amounts for that time of year. But by January, the high had strengthened and only very weak rains had fallen over Southeastern Brazil with most other areas remaining dry. Now, drought appears to be re-establishing a strong grip as weather forecasts call for the typically strong January rains to be cut in half. The ongoing drought has had serious and widespread impacts throughout Brazil — curbing production of everything from soybeans and sugarcane to coffee and cattle. But the worst impact has been to the water supplies of one of Brazil’s most populous regions — the Sao Paulo megalopolis. There, an unofficial water rationing has been in place since early 2014. A rationing that has hit Sao Paulo’s least advantaged residents the hardest. 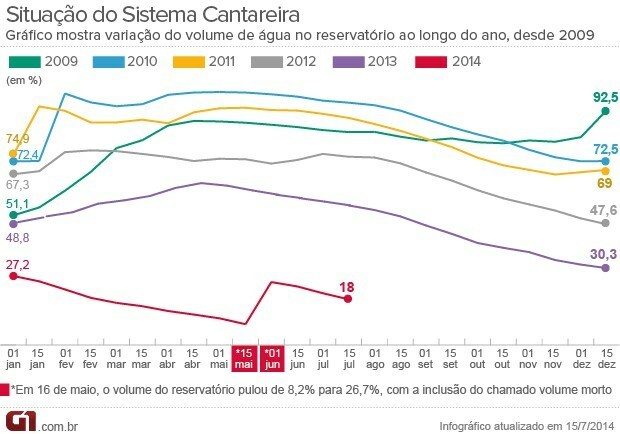 Over the past six years, water levels for the Cantareira reservoir have been in free-fall. By 2014, an 80 year drought pushed already falling water levels radically lower. As an emergency measure, officials added dead pool volume — a level usually below municipal water inlets — to the reservoirs stated reserves. This move coincided with shifting water levels lower. But the action only bought time for the failing reservoir as month after month of drought continued. By austral spring of 2014 (October), the Sao Paulo water system was again under dire threat. Water levels at the Cantereira reservoir fell to below 6% percent before officials diverted water from other sources and allowed use of water below even already lowered levels. This new arrangement moved water inlets deeper into the drying reservoir. An action that essentially dropped Canteriera outlets to city water supplies into the mud. These emergency actions by city and water planners added another few percent to the radically diminished water supply. Hopes remained that rains would return with the wet season starting in November and that levels would rise enough to make it through the next summer. But with rains remaining weaker than normal throughout November and December, water levels kept falling when they should have been rising. By early January, reservoir levels had again fallen to below 7 percent. On Monday January 5, 2015 the level of Sao Paulo’s Cantariera reservoir was at 6.9% capacity. Today, just one week later, the same reservoir measured 6.5%. In total the Cantareira reservoir serves 9 million residents in Sao Paulo. These are mostly middle and lower class neighborhoods. And if the current weather situation continues, that reservoir could be empty come the start of the dry season in April. Such a situation would force an even more extreme water rationing on a state that has now become famous for water scarcity. Unfortunately, Cantareira isn’t the only Sao Paulo reservoir under threat. In total, 5 out of 6 reservoirs representing the lion’s share of all water for more than 20 million people are now at 39 percent capacity or below. The Sistema Alto Tiete — a smaller reservoir serving about 4 million Sao Paulo residents — is not far behind Cantareira. For as of today volume in this reservoir stood at 11.3 percent capacity. A third and fourth reservoir system — Rio Claro and Sistema Alto Cotia — now stand at 27.5% and 30.% capacity respectively. Together these two systems serve another 2 million people. The Guarapiranga reservoir, at 39.2 percent capacity as of 1/12/2015, serves another 4 million people. A final Sao Paulo reservoir — the Sistema Rio Grande — serves about 2 million residents and remains just above 70 percent capacity. If current forecasts for January hold and February-March follow present trends, then all these reservoirs with the probable exception of Sistema Rio Grande will be under threat entering the fast approaching dry season. A situation that would put nearly 20 million residents under severe threat of losing municipal water services. In addition to Sao Paulo, recent reports show that 93 cities have rationed water services to ever-broadening populations. In total, more than 3.9 million people are estimated to have had their water rationed. In some cases, water has been cut off to broad areas for as long as five days. This official water rationing began last year. But this year’s rationing is broader in scope with water cut offs, which were at first limited to isolated rural zones, now stretching into larger urban population centers. As mentioned above with Sao Paulo, this water rationing is occurring during the rainy season when water supplies should be building. However, with rainfall totals for Brazil this summer far less than the historic average and with a continuation of the worst drought in more than 80 years, most reservoirs show dropping levels when they should be filling. In total, what we see for Brazil is a sad example of what a combination of climate change and deforestation can do to a previously water rich region. Bad management in the face of this crisis and instances of climate change denial are exacerbating an already desperate situation there. The Cantareira reservoir fell to 6.4% capacity on 1/13/2015 — a 0.5% loss in just 8 days. System losses at this rate bring the reservoir to zero in about 100 days. However, the current capacity, due to very low level of water outlets may not be fully useable. In addition, rainy ends in April at which point levels would be expected to drop more precipitously.